The Government is set to launch “Pakistan Banao Certificate” a dollar-denominated diaspora bond on January 31, 2019. The certificate is to tap into the international savings of overseas Pakistani to enhance foreign exchange reserves. Prime Minister of Pakistan Imran Khan will address the launching ceremony of Pakistan Banao certificates on Thursday 31st January 2019. The plan was to launch the bond in October last year but delayed after Prime minister call for donations to the dams. So, they stop the launch and now it will be launch by the prime minister himself. Asad Umar, the Federal Finance Minister, told media that there are two maturities of certificates. Another one with five-year certificate maturity carrying 6.75pc return. Minimum Investment Amount: USD 5,000 or higher in the integral multiple of US$1,000 with no maximum limit. Transfer of Funds:The investor will remit the intended investment amount from his/her own account outside Pakistan to the SBP account with National Bank of Pakistan (NBP) New York to be notified to the investors on completion of investment details on the portal. He further added that total four Banks had been selected to complete the transactions. 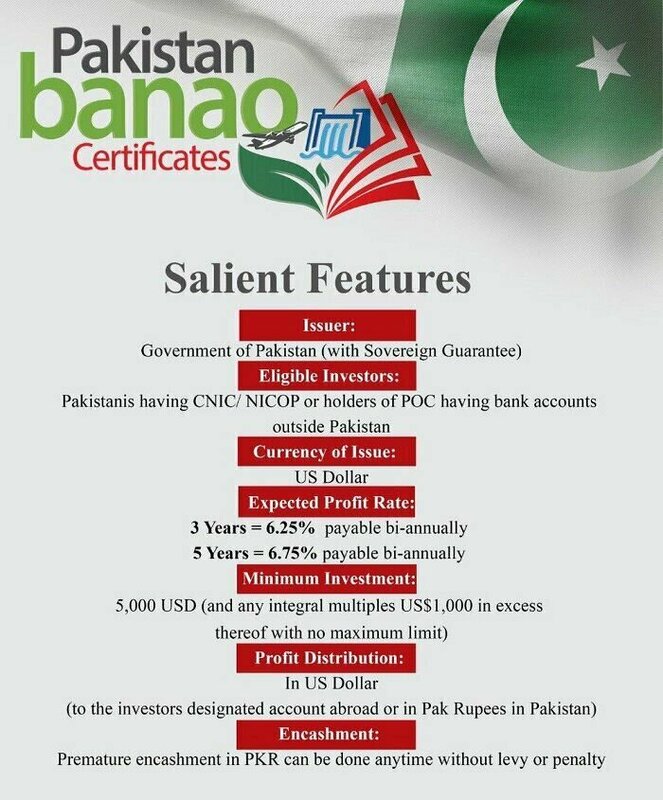 Pakistan Banao Certificate Will be launched worldwide with the collaboration of Government and State bank of Pakistan. On Thursday the rules of the certificates were approved by the deferral cabinet as it was the first ever transaction of its nature which is only for overseas Pakistanis. The Pakistan Banao Certificate would be payable to the Pakistani investors in their accounts maintained overseas on a semiannual basis in foreign currency and with the choice of local payments in local currency. Computerized National identity cards maintain accounts abroad national cards for overseas Pakistani is compulsory for certificates. These certificates already marketed on different platforms like electronic, digital and print media from January 28 to ensure maximum outreach to potential investors. For further marketing, road shows, awareness sessions will also be held for the overseas Pakistani in the countries where government want to target people. How can the nation secure it’s future, when it takes the name of “state of Madinah” but declares the war against Allah and his messenger. O ye who believe! fear Allah and give up what remains of your demand for usury, if ye are indeed believers. If ye do it not, take notice of war from Allah and His Messenger.” (al-Baqara 278-279). The supporters who are raising voices in favor of this step are no different from the army which is fighting the war against Allah and His messenger. Result of the war is sure, that who will be the winner.